Most people hear ‘affordable housing organization’ and assume a certain amount of fundraising and governmental intervention to maintain operations. And for a lot of housing models, that is absolutely true and entirely crucial to success. Without funds to boost operations, organizations would be unable to deliver the critical services that they provide to populations in need. But what if we told you that for NHA’s unique mixed income model of housing, it is (almost) as simple – and as hugely important – as social impact renters? At Norfolk Housing Association, our mixed model means that half of our residents pay rent geared-to-income – they pay a percentage of their income, regardless of what that is (with a minimum base), which allows persons on lower or fixed incomes to live in excellent, stable housing and be part of a community of their choosing. The other half of our residents, the aforementioned “social impact renters”, pay market rent – rents normal to, or slightly below, the current market price for a given neighbourhood – knowing that their full rent payment directly offsets another person’s rent, allowing both parties to live in a diverse, inclusive community that promotes overall social good and a healthy economy. Social impact renters benefit too. Hugely. The misconception here might be that only half of NHA’s population benefits from our mixed-income model. But that just isn’t true. In fact, our market renters are quick to share all of the ways they benefit from being part of our community. At NHA, it’s important to us that rent and utilities are kept affordable for everyone. This means that we never raise rents more than 5% annually – for any of our residents. It also means that everyone, whether they pay market rent or not, has access to incentive programs such as Calgary Dollars, which allows residents to turn in a portion of their rent through Calgary Dollars instead of federal currency. That translates to savings across the board! Beyond that, social impact renters have access to a diverse community with rich amenities in a sought-after section of the city. Not to mention, we’re pet friendly and compassionate, meaning they also get to live with the security of knowing that in the event of a major life change, they have landlords who will work with them to ensure their continuity of home, safety, and stability for the long run. Plus, we’re pet friendly - and I think we can all agree that pets make everything better! Together, through the mixed income model, neighbours advance an inclusive and respectful community; this ripples out of our buildings and is echoed into the communities that Norfolk serves (and beyond). Social impact renters are not the only reason the mixed model works – but they are at the very heart of it all. The new Canada’s Food Guide is a welcome change from the highly structured and restrictive days of its past. The new guide no longer looks to dictate your diet in perfect portions, but actually act as a guide. The eye-catching new plate diagram is a much easier portioning system to understand, and replaces the old (highly-industry influenced) rainbow. The main recommendation is simple: eat more plants. It isn’t about cutting out meat, dairy and grains, but simply shifting our portion sizes to have the focus be on vegetables and fruits. Cooking takes time, and if that is something you’re short on, try to carve out just a couple of times a week that you commit to cooking dinner- and get the whole family involved if possible! Make it fun by trying a new recipe (pro tip- head to the third floor of our new downtown Calgary Public Library and take out a cookbook to base a whole meal around), play music or listen to a podcast while you cook, or appoint one of the kids ‘head chef’ and allow them to choose the meal plan for the evening. Feeling uninspired? Come by our weekly Farmers’ Market on Wednesday to find some fresh ingredients or chat food with our awesome vendors. Host a potluck or dinner club with your friends and neighbours! Themes help make group meals easier- choose a culture to explore, have guests bring items that align with the theme, and play music from that country to create some great atmosphere! New to the neighbourhood or looking for a way to get to know some more folks in the area? Every Thursday at the HSCA from 6-8pm everyone is welcome at our Neighbour Night program where you can share in a vegetarian meal, and a fun activity. Additionally, the second Friday of every month we host a Community Potluck- all are welcome! It seems simple, but when it comes to food- you should enjoy it! Eat what you like. But of course, try to keep the focus on plants! If you don’t like vegetables much, find at least one you do enjoy (at least a little bit!) and look up several different ways to prepare it. Cauliflower doesn’t always have to be steamed and bland… try it as a garlic mash, with chickpeas in a curry, or as cauliflower “chicken” wings. If you don’t enjoy what you’re eating, you’ll cook less, and rely more on processed and convenience foods. Eat local to improve flavour and nutritional value, and try new things! Variety is the spice of life after all. It’s only natural to make plans that safeguard against the unexpected—that’s why we buy insurance and plan our estates. A prepaid funeral is no different. Planning ahead for a funeral is a pragmatic decision that protects your family’s financial resources and helps to ensure your final wishes will be honoured. Consider these reasons to pre-plan funeral services. When you plan your funeral plans in advance, you have the opportunity to learn about all of your options—from customized keepsakes to personalized funeral services—in a relaxed environment. Without a prepaid funeral plan, your family may feel emotional and rushed when making decisions for you. Planning ahead gives you time to research your options, communicate with family members and even add personal details. Funeral planning in advance allows you to create a fitting tribute that will reflect your passions and unique personality. The two biggest questions that family members face when a person passes away “What would they have wanted?” and “Did I do the right thing?” are answered for your loved ones forever. Personalizing a funeral can be as simple as playing your favourite music or holding a service with your favourite flowers. If you like to be the life of every party, you could plan a lively event with a catered meal, live music, and photos or videos of the memorable events that make your life unique. The more personal you make your memorial, the more memorable it will be. For more information, or if you have questions, please attend the next Dignity Memorial – Your Life Your Legacy workshop at HSCA on Tuesday, March 19, 2019 @ 7pm in the HSCA Hearth Room. This is a free workshop open to anyone. The HSCA Board of Directors is pleased to announce that Kate Stenson will take over the executive director position. Kate stepped up as interim ED during the previous transitions and has been instrumental not only in coverage for that position, but also in ensuring that the board, staff and volunteers remain on focus with our vision and objectives. 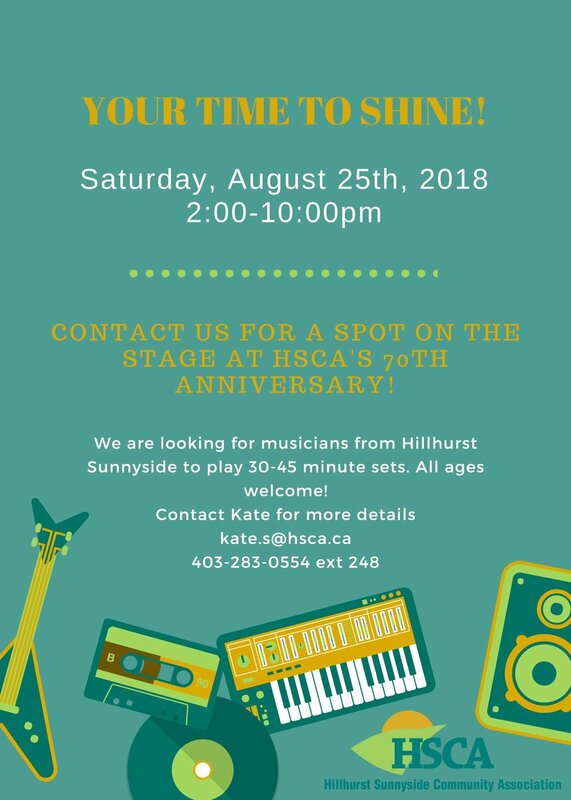 Kate’s connection to the Hillhurst Sunnyside community and HSCA is a lifetime one. Kate grew up in the community and attended Hillhurst School and was a participant in the HSCA Out-of-School program. Kate also participated as a vendor and volunteer of the Hillhurst Sunnyside Farmers’ Market for many years. Her passion for food security and advocacy brought her back to HSCA in the spring of 2013 when she joined as our Community Food Program Coordinator. She progressed to Manager of the program and then lent her skills and expertise to oversee HSCA’s community programs (Daycare, Out of School Care, Community Food Program and Community Connections). We believe that HSCA has flourished under Kate’s leadership and will continue to do so as we move forward as an organization. Please join the HSCA board of directors in welcoming Kate to her new role. Tyler Chalmers President, Board of Directors Hillhurst Sunnyside Community Association. It’s time to talk about the climate crisis. In the aftermath of the flood of 2013, amongst the wreckage and the lost memories, was the powerful gathering of community. We, as neighbours, friends, and citizens, lent each other a hand, an ear, and a shoulder to cry on. We supported each other through the disaster, and we are better people for it. A new disaster looms, but this one is slower moving, and less obvious. And we have yet to rally our community, in fact, in a lot of ways we are pretending it’s not even coming. It is the climate crisis, and it is knocking at our doorsteps. We do our best to avoid talking about it, because who wants to talk about the implications of a rapidly degrading climate? It’s just not that fun. But it’s time to stop avoiding the issue, because it is through conversation, through discussion, that the solutions are found. And it is through laughter, and community that we will find the path to creating our better world. The Calgary Climate Hub and the Hillhurst Sunnyside Community Association would like to invite you to be a part of the inaugural Community Climate Conversation series. To be held on Tuesday, Feb 5th at 6:30 pm at the HSCA, we’ll start with some proposed solutions: from the city, from energy efficiency experts, from renewable experts, from academics. And then we turn it over to you, to talk about what YOU want to do. How we can help each other create the future we want to live in. How we can support each other through the difficult times. And celebrate the many little victories that will come our way. Invite your neighbours. Invite your friends. Let’s talk about the climate crisis. And let’s figure out how to keep all the things, and the people we love, safe. Wow! What a year it has been for both HSCA and me personally. On October 17th I celebrated my first anniversary at HSCA and I have had a wonderful experience getting to know the staff, volunteers, program participants and my favorite, the children in daycare and OOSC. Pure bias on my part, as I love little humans! In the midst of my first year I had a very challenging experience whereby I sustained a head injury at work on July 3rd. Despite my efforts at pushing through and trying to rush my healing, the injury won and I spent three months recovering, six weeks in a brain injury program. I could not have taken the time to heal without the support of the Board of Directors, the amazing staff team, and my family and friends. While a few symptoms are lingering, I am healing and feel blessed in every way. This last year saw another successful year in our childcare programs and our partnership with the provincial government providing affordable childcare. 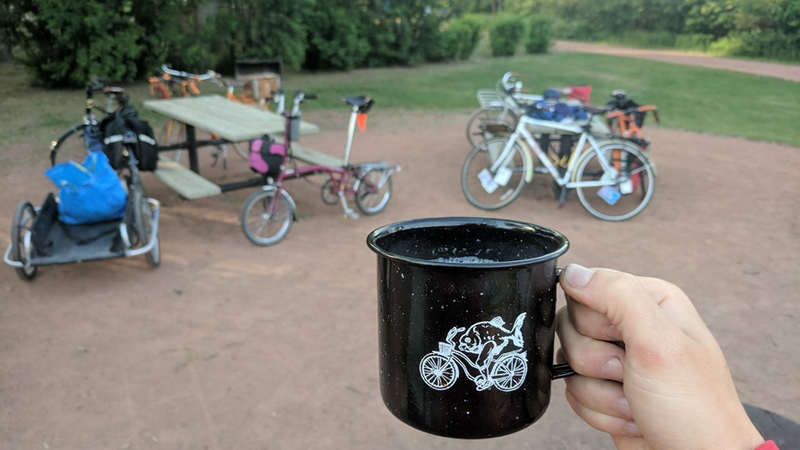 We have had great connection with the community and were able to host a Stampede Breakfast and our 70th Anniversary party. We are currently seeking donations and support for a number of areas including; Hearth room renovation, adding an extra room to the daycare and renovating our Board Room. If you are considering a financial donation for the end of the year, we would very much appreciate your support. We can accept donations online through Canada Helps, through Benevity locally and if you are involved in a United Way Campaign at work, you can designate to HSCA. Thank you to all of the local businesses, not for profits and residents for all of your ongoing support. We are proud to be your neighbours and partners in Hillhurst and Sunnyside. May the winter season bring you and your loved ones closer together. May you share joy, laughter and food and celebrate all that is good in our lives and our community. I hope 2019 is full of love, kindness and celebration. Fresh Food Basket Summer Fundraiser- Thank you for your support! The Hillhurst Sunnyside Community Association Fresh Food Basket Program provides an anonymous, dignified and sustainable strategy to improving access to good, healthy food. We see an average of 60 families weekly, distributing over 350 portions of fresh food. This program does not seek to solve food insecurity. Poverty and the inaccessibility of our food systems are complex issues, and cannot be solved with basic needs programming. However, we hope that this program allows the families that access it to feel more at ease about where their groceries will be coming from, and allows us to make connections with participants and offer support in other areas. The Fresh Food Basket is a first step in community engagement. When basic needs are met, vulnerability decreases, and we see an increase in the ability to create connection and participate in community. Moving forward, we hope to depend less and less on donations, and hope to see an uptake of this style of program across other communities in Calgary. This program is one that requires little infrastructure to start-up, but provides a highly valuable service to our community. 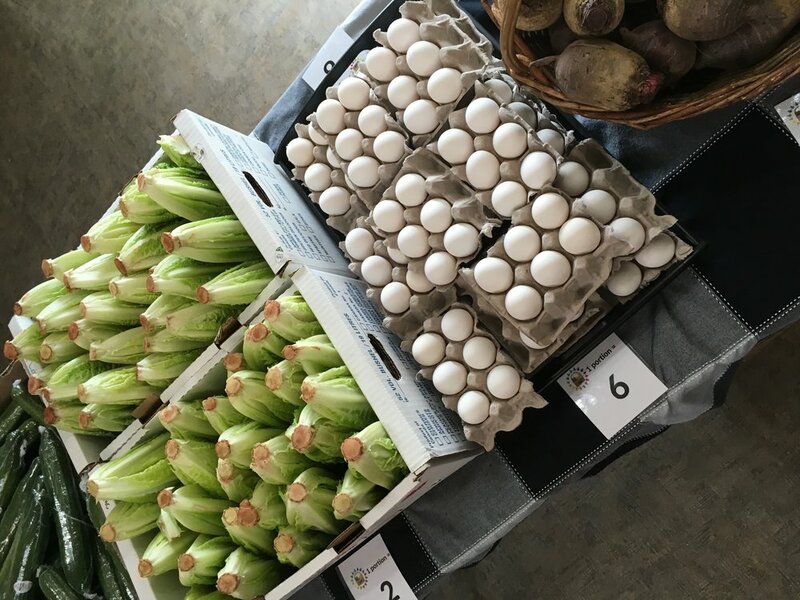 This summer we have seen an increase in food donations from our Farmers' Market vendors, and have received many donations from community members! Thank you so much to all the community gardens, vendors, businesses and community members who donated to our Fresh Food Basket Summer Fundraiser this year. We would like to extend an extra-special thank you to TrueBuch Kombucha for a generous donation, and our Sun Fun Summer Day Program for their bake sale efforts! If you missed out on donating to our Summer Fundraising campaign- no need to fret! We accept donations ALL YEAR ROUND. Currently our biggest need is cash donations so we can purchase fresh produce weekly, and healthy non-perishable items for the holiday season. Donations can be dropped off to the front office at the HSCA during business hours, mailed or made online. If you require more information about this program, please contact Heather at heather.r@hsca.ca. The 70th birthday of the Hillhurst Sunnyside Community Association gives me pause to think back on my 44 year relationship with the community. In 1982 I bought a reprint of a book from the HSCA called Hillhurst Sunnyside Remembers by Margaret Tanko. It was simply made with black and white photographs and stories told by members of the community, some who had lived here since the early part of the 20th Century. The book charmed me and became a treasured part of my library. I have always loved Hillhurst Sunnyside because of its heritage houses, mature trees, vintage lilac bushes, layers of history, diversity of residents and small town feel. As time passes, the community continues to grow and change, but recently these changes have become alarmingly rapid changing the look and feel of the neighbourhood. Residents come and go. Old houses get demolished to make way for condos altering the heritage character. Businesses open and close on 10th Street, 14th Street and Kensington Road. The land Calgary stands on is the traditional territory of the people of the Treaty 7 region in Southern Alberta. This includes the Blackfoot Confederacy (Siksika, Piikani, Kainai First Nations), the Tsuut’ina First Nation, and the Stoney Nakoda (Chiniki, Bearspaw, Wesley First Nations). The City of Calgary is also home to Métis Nation of Alberta, Region III. They have been the stewards of our land for thousands of years and continue to maintain a very positive relationship with it. English and Scottish settlers arrived in this area, now known as Hillhurst and Sunnyside, as homesteaders in the late 1800s. New Edinborough was the name of the suburb created between 10th Street and Centre Street that eventually became Sunnyside. In 1914 it was incorporated into the City of Calgary. The Canadian Pacific Railway (CPR) built workers’ cottages in Sunnyside on 25-foot lots and rented them to their employees. Many of these cottages still remain today, although they are quickly disappearing due to development spurred on by City Council priority of densification. In the early days Sunnyside residents took a ferry across the Bow River to get to work at the CPR or the Eau Claire lumber mill. Now we hop on an LRT. Squatter Felix McHugh staked a claim to homestead on CPR land. The CPR contested it but he was successful in receiving one acre of land through the courts. He built a house at the corner of 9A Street and Memorial Drive, where the green space with a Community garden now exists and the LRT tracks go overhead. McHugh Bluff is named after him. Ezra Hounsfield Riley was a pioneer rancher and politician who owned the property west of Sunnyside. He also purchased McHugh’s. Eventually Riley sold his property to the City of Calgary and it became Hillhurst, West Hillhurst, Sunnyside and Hounsfield Heights. He donated the land that is now Riley Park to the City of Calgary. I am including a photograph of Gleason family in front of my house on Memorial Drive in 1914 when Hillhurst was a new suburb. Michael and his brother James built two houses side by side on lots purchased for $650 each using materials from the Eau Claire lumber mill at a cost of $1,250 each. Taxes were $68.50 a year. The 10th Street steel and girder bridge is in the background. The City of Calgary’s saplings were newly planted and would stand for almost 100 years. The streetscape shows similar houses on small lots with picket fences lining “Westmount Boulevard” (as it was known then). I peruse my little 24 page Hillhurst Sunnyside Remembers book with the stories and photographs so lovingly gathered and assembled by Margaret Tanko and wonder who she was and how the book came to be. When I moved into Sunnyside the HSCA had just fought the city to stop them from turning Memorial Drive into a freeway. Instead Bow Trail was built on the other side of the river. HSCA also slowed the construction of apartment blocks during the ’70’s by insisting that the community preferred homes with yards for families. Is it time for more stories that document the 40 years since Hillhurst Sunnyside Remembers was published in 1978? Do you remember the protests about the LRT? Shoppers Drug Mart taking over Telstar Drugs? The Saturday School? Communicare? Art classes held at The Heart Studio in the home of Carol Bondaroff and Stan Phelps? Fighting to keep the schools open? The Fall Fair and Parade? Did you witness the fire that destroyed the Ross Kerr Block? Or St John’s Church? The Carpenters’ Hall all ages gigs? Gallery 510 in a Sunnyside garage? Wreck City? Ant Hill Fabrics? The blacksmith shop in the backyard of a Sunnyside resident? In 1912, changing cabins were built on Hillhurst Athletic Park at the corner of 14th Street and 5th Avenue. The cabins doubled as meetings space until a small community hall (HSCA) was built in 1953-54. In 1948, HSCA was incorporated as a non-profit society by the Government of Alberta. 1978, a new community centre was built in the Hillhurst Athletic Park incorporating the 1953 Community Hall and for the last 40 years staff, volunteers and residents have strived to maintain a healthy and vibrant quality of life for the residents of Hillhurst Sunnyside. We would like to recognize the milestones throughout this community's incredible history. We wish to celebrate our 70th anniversary of incorporation as a non-profit society with all the residents and neighbours of Hillhurst Sunnyside, past and present. We hope you can join us for a day of community. On Saturday August 25th, 2:00pm-8:00pm in the Hillhurst Sunnyside Community Association fields and parking lot, we hope you and your friends, family and neighbours will join us for a community party. Please review the event schedule below so that you do not miss out on the fun! Last year (2017), HSCA surveyed our community residents to gather feedbac, ideas and information to better serve you. We heard from over 500 people, including a diverse range of renters, owners, apartment and household dwellers, age groups and income levels. Future planning for social, recreational and leisure programs and services in the community. Thank you to everyone who participated in the survey, providing rich and valuable information to inform the work we do and help us build the future of your community association! I’ve lived in urban areas all my life, whether it was a big house or a small apartment, I was always part of a community. 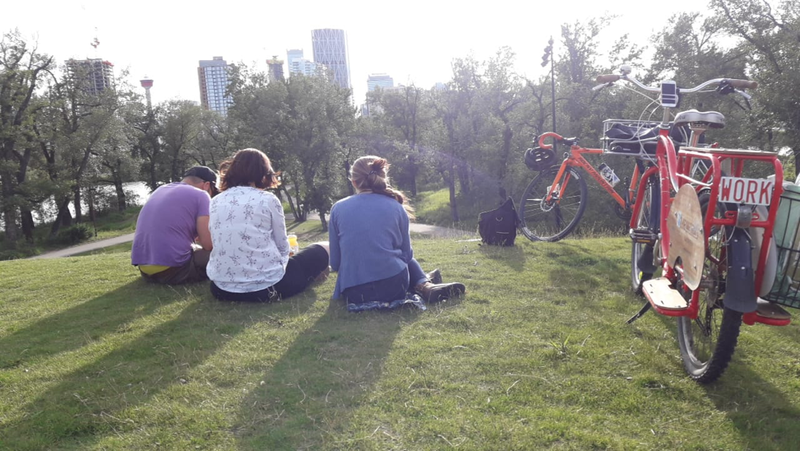 Nevertheless, some months ago when I arrived to Calgary chasing after a new challenge, I was able to discover a very different way to live in a community, as well as having a much better understanding of the concept of living as a community. At Hillhurst Sunnyside Community Association you can find many different programs that reflect community values and make it a model Community. After a quick look in the Hillhurst Sunnyside Voice I decided to check out the ESL conversation club with my parents to practice some English and meet some new people. After a nice long talk with awesome interesting people in a very friendly environment, where everybody respects and shows much interest in hearing what the others have to say, I felt motivated to find out about how to get more involved with the community that had opened its doors to us. During one of the monthly community Potlucks last year, where I got to meet and share a meal with my new neighbors, I was told about a possibility to volunteer as a vendor in the weekly Farmer’s Market. I decided it was a great opportunity to get involved with the other members and show commitment to the market and myself. The Hillhurst Sunnyside Farmer’s Market is a great event that takes place in a professional, but friendly environment. You can find an extensive variety of original, tasty, healthy food and products, and even do your shopping while you enjoy some exciting live music, but most important you get to interact with energetic vendors who believe in their growing businesses and serve customers with a smile every time. As a volunteer vendor, I’ve been able to learn a lot from the market, it has been a completely new experience for me that will help me gain success in my future work related fields and I had the pleasure to meet and learn more about all the amazing persons that lead the market weekly in order to create a major beneficial impact in the community. After having become more familiar with the market and the community I decided to volunteer in the Neighbor Night program too. During the sessions kids get to use their energy in healthy fun ways, while parents engage themselves with fun activities too and neighbor interaction, not before having a tasty vegetarian meal that the program’s coordinator, Shaye and volunteers have kindly prepared to make the evening even nicer. Working with kids was a refreshing new experience for me, one that I didn’t expect to like so much. In theory, volunteers are supposed to look after the kids while they enjoy some playtime with each other, but I couldn’t avoid getting involved in play with them as if I were a child myself again. The kids’ responses made me very happy, it is very healthy for the soul to make some children smile and laugh even if it is just for a few hours a week. To be a volunteer has been a wonderful experience for me. HSCA has shown me the right way a community should work as well as helping me with the adaptation process. HSCA is an inclusive community that will welcome you under any circumstance without hesitation. You can always find a program that suits you, from a simple interaction with your neighbors to sports recreational classes, everyone will show you a friendly face and try to assist you. From day one, I have been treated with solidarity and respect, I’ve met some awesome members of the community who I consider my friends and now I realize I am not just living in a community, but I have my own impact on it, helping the development of something we can all enjoy together as members of the community. If you are trying to find the nicest people in Calgary, you might want to check Hillhurst Sunnyside Community. You may have walked by, or ridden your bike past, a new art installation in Sunnyside. This community mural was created by Miró Esteban (14), grandson to active community members, Buff and Richard Smith. We caught up with Miró to ask him more about his motivation around the mural and how it was executed – even in the near freezing temperatures we had this past spring. 1. We heard the mural was a gift for your grandmother, is this true? What made you decide to do this as a gift? The mural was a gift for my grandmother, she wanted a mural on the fence for a few years, but my grandpa was unsure. 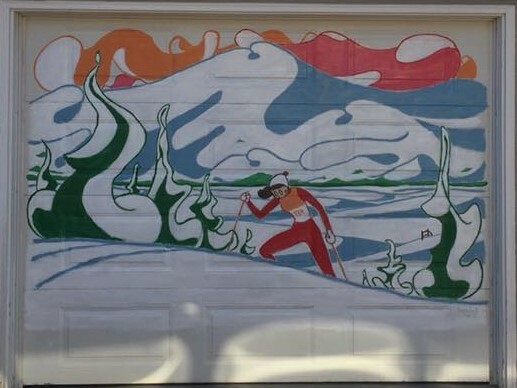 This Christmas my grandpa decided to go for the mural. So, as a gift he flew all of us to Calgary to paint the mural. The original idea was for my dad to design the artwork. Recently, I had been trying out a new style, so he asked me if I wanted to do the mural. And that’s how I ended up doing the mural. 2. How long have you been painting or drawing? I have been drawing all my life. In our old house, we had an art wall that would rotate as me and my sister would make new drawings. We have thousands upon thousands of drawings stored away. It’s a lot of [fun] to look through them and see how my art style has progressed. 3. 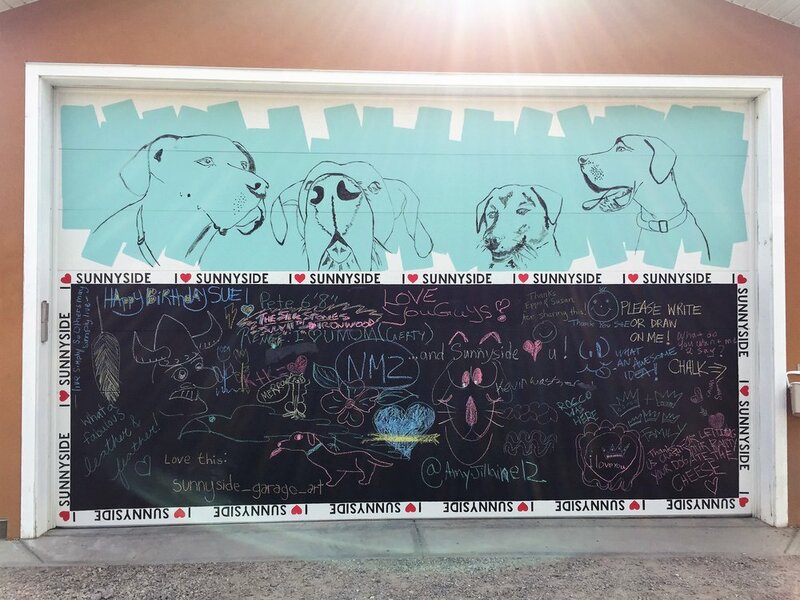 How did you come up with the idea/concept/images for the mural? The main idea of the mural was based off a very large bookmark I made earlier, the bookmark had a few different biomes that would morph into different landscapes. But instead of being very long it was very tall. As I was doing the mural I had one main struggle. Normally when I’m drawing I like to make the drawing extremely detailed. But I knew I couldn’t make it so detailed for the mural since we would have to paint it all. I also tend to make more creepy/dark art, so it was a lot of fun making all the cute and silly creatures. I know my grandma loves frogs and birds, but I’m not very good at drawing them so I made some [frog] and bird like creatures. But a lot more strange. After I made the drawing I uploaded it onto the computer and started adding colour. For almost all my drawings I keep them in black and white. So this was a new experience for me. I knew I had to stay to a limited colour palette, otherwise my grandpa would have to buy too many colours of paint. I decided that the first section would be a main theme of greens, with accents of purple and blue. The second area was an ocean so I made it blue, and then contrasted that with reds and oranges. 4. How did you execute the project? What were the outlines of the steps taken to complete this? Executing the project was definitely the hardest part, we worked pretty nonstop the week or so we were there. It was made a lot easier by all the help we had, our cousins came to help (which was very exiting since we only see them yearly)! We had nine people to work on the mural. We had to set up a whole tarp area around the fence section we worked on with space heaters inside, to let the paint dry. The first day we got there we waited until night and set up the projector and then started working. We wanted to have all the pencil outlines done before our cousins got there. We managed to finish the outlines for the whole fence. It was a little stressful for me since I’m a bit of a perfectionist, a lot of the lines wouldn’t line up because we would have bumped the projector. My dad kept telling me that it would all be fine. It was still very exciting to see my art start to come to life. The next day we set up the tarps and started painting, my dad said that out of experience it would be easier to do the black lines after the painting. I wasn’t sure, but I trusted him (he was totally right!) after the painting we did the lines for that section and then started the painting for the next section. As we were on the second part it was snowing like crazy. But we still managed to heat it up enough to work. Now when I see a mural I appreciate even more how much time are put into them. 5 Why do you think community art projects like this are important? I definitely think that community art projects are important. I’ve actually always liked graffiti, not the one were people just write their name in black spray paint, but the large colourful drawings. I feel they classify as art. Murals are just like organized, planned graffiti. It makes boring surfaces a lot more interesting to look at. Especially if you do something unique. 6. What does community mean to you? Community has always been very important to me. I have lived in the same house all my life, so I know all the neighbours very well. We have a tradition that if anyone gives you food or treats when you return the plate it must have food on it again. We also lend each other ingredients whenever necessary, we don’t pay each other back because we know that if we need anything our neighbours will share. 7. Why do you think this mural is a good fit for Sunnyside? I feel the mural fits Sunnyside quite well, at least my experience of it. My grandparents have always been very community driven, they know everyone in Sunnyside. (Well probably not everyone, but they know a lot of people.) I find the mural reflects this community. All the creatures in the mural have different relationships to each other and the landscape. It’s like a large community of creatures. 8. What advice would you give to other aspiring artists or community builders? My main piece of advice to aspiring artists is don’t care what other people think. I draw for me, and the pleasure of drawing. I don’t really care what others think about my art, even though it is fun when others enjoy it, because I love making my art!